Volunteers are valuable assets in The Salvation Army's efforts to meet the greatest needs in Des Moines. By giving their time and sharing their skills, volunteers make significant contributions to society every day. Their positive influence changes lives, uplifts families and strengthens their communities. View current volunteer opportunities at a Salvation Army location near you or call 515-282-3599 and discover the joy of giving back to those in need. Each Tuesday and Friday morning, The Salvation Army's mobile canteen services breakfast to around 1,000 homeless and near-homeless individuals in Des Moines. The menu features a hot egg casserole that provides a delicious, high-protein meal. 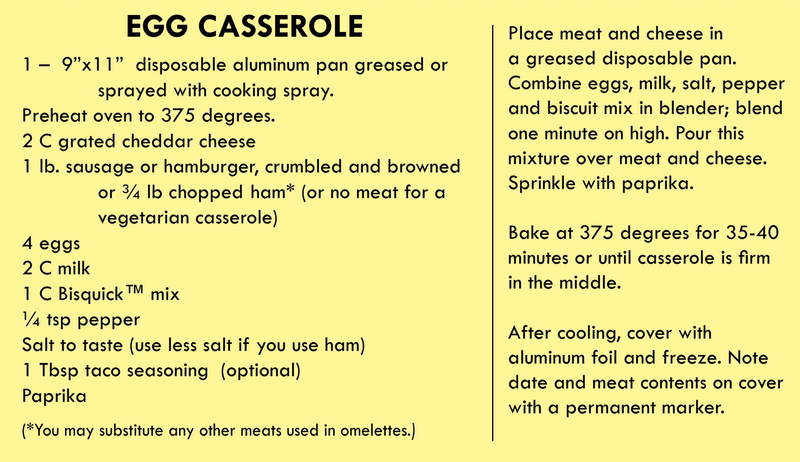 You can help feed our neighbors in greatest need by preparing egg casseroles (recipe below) to be served through this food program. Each casserole feeds 10 people, with 150 casseroles needed each week. To learn more or sign up to volunteer, call 515-282-3599.